The middle of March is usually a great time for really solid comedies, as Spring starts to rear its beautiful head and old man winter clocks out for 9 months. Last year we were given the fantastic Jason Segel/Paul Rudd bromantic comedy “I Love You, Man” and Jody Hill’s dementedly brilliant “Observe and Report”. The year before Jason Segel yet again appeared when he wrote and starred in the uproariously funny “Forgetting Sarah Marshall”. Unfortunately, the new Gerard Butler/Jennifer Aniston vehicle “The Bounty Hunter” isn’t particularly great at being hillarious, uproarious, or fantastic, but at the least it’s serviceable to the big fans of the romantic comedy genre while being a complicated mish-mash of storytelling elements. The story is fairly and rightfully simple, setting Gerard Butler as an “infamous” ex-cop/bounty hunter who is tasked with bringing in his ex-wife Jennifer Aniston after she skips a court date. Through the movie the two go back and forth as he trys to bring her in for his cash reward. There’s a really fun concept here that’s shown a lot in the trailer, and on paper when you take a fun road trip style concept like that and you pair the talented director from Hitch (which was a comedy that I loved), you’ve got a great fun ride at the movies anyone can have a great time with. You could take that, extend it over an hour and a half, mix in some broad comedy with some smart wit and you’ve got another Hitch-esque fun time. For the first quarter of the movie, it sticks with that idea and was really promising, but as it started to continue along, I eventually turned by head, sat back in my seat, and wondered “Where’s this going?” As the film continues along past the first 1/3rd, it collects this unnecessary baggage in the form of extra plotlines that’s just not needed. Less than 40 minutes into the movie it starts to dip into a mystery tale that the film just doesn’t need at all. It’s hard to follow through a majority of the movie and is ultimately uninteresting. 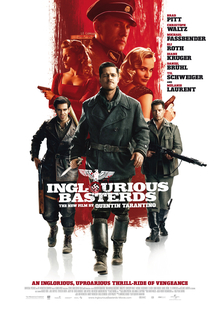 That, combined with off-an-on action that for the most part work and a sprinkle of average comedy, culminates for 3 half-hashed elements that taint the rest of the movie. This ends up sacrificing time and effort that could have went into making the romance and comedy, the better elements, all the better they could have been. It’s just disappointing that the fun premise we’re promised is lost in the shuffle of frenetic and sometimes confusing direction. That’s not to say The Bounty HUnter isn’t an enjoyable movie. Fans of the romantic comedy genre, not looking to what could have been, will be pleased. There are other remote elements that the film does well. There are a few really fun set pieces the director Andy Tennant utilizes, including the parade chase at the beginning of the film that uses a great rooftop running sequence, the chase/driving shot at the golf course that got a number of laughs from me, and a car chase scene in the infamous Chicago railway used countless times before that comes toward the end of the movie. 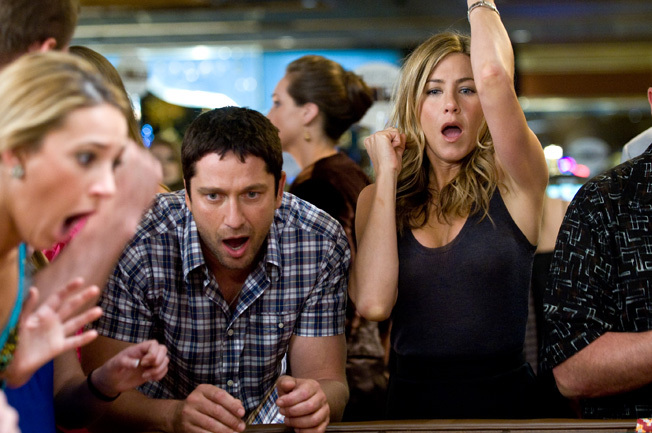 Gerard Butler and Jennifer Aniston also work as leads that are consistently likeable, and at times have their moments of comedic charm. Jeff Garlin shows up to do his schpiel and Jason Sudeikis does the stalker schtick well. I actually found myself cracking up quite a few times in some of the moments of physical comedy. Overall, I thought I had a pretty sufficient analogy talking to a friend Friday night after my screening. It seems like Andy Tennant and his crew shot a film that was just a road trip romantic comedy that was really fun, and then realized they only had about 30 minutes of footage. So they went and added an unnecessary mystery plot to “keep the guys interested” and because of it you forget the two leads are supposed to get together and there’s not enough time to get to know the two before a mystery plot point pops up to take you out of that moment. All in all, if you’re willing to overlook some filmmaking flaws that add some completely unneeded weight to the film (which chances are if you’re the target demographic or you’re looking for a date film you’re not), then you’ll have a fun time at the cinema. However those looking for romantic comedies up to par with Tennant’s previous work in Hitch need look elsewhere. I was checking out my list of the 50 Best Films of the Past Decade, and I had realized I had forgotten a movie or two, or three or four, so I just wanted to take the time to point out a few films that are definitely worth checking out, from a documentary to the best crime gangster film I’ve ever seen. Once is a romantic musical film that is so worth your time. It’s the story of two immigrants in New York, both from middle Europe, that eventually end up meeting each other through playing music on the sidewalks of the city. Glen Hansgard and Marketa Irglova portray their parts so convincingly and through a series of run-ins on the streets they fall in love and begin playing music together. This music narrates their journey together, including the Oscar-winning song “Falling Slowly” that will give you chills through the movie. I found it at Wal-Mart the other day for $10, and it’s definitely worth it. 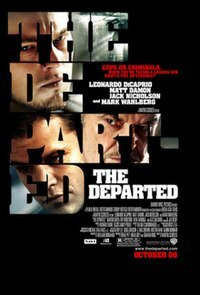 The Departed was, and continues to be my favorite crime-drama-epic-tragedy film of the past 10 years. Jack Nicholson runs a New York crime family who sends an undercover prodigee (Matt Damon) into the ranks of a police force to sneak behind their ranks, while their head of department (Martin Sheen) sends in their own (Leonardo Dicaprio) undercover into the mob. Scorsese films this beautifully with these unforgettable shots in beautiful locations, with some fantastically written dialogue that builds up scenes with really long shots in the same locations and some brutal, unflinching violence that constantly reminds the audience the danger each and every one of the characters is in. It also won the Oscar for Best Picture, Best Director, and two others. It’s at Target I know for $7-$10. 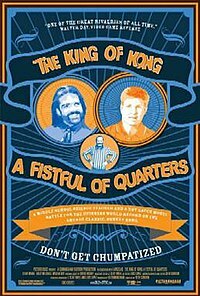 The King of Kong: A Fistful of Quarters is a must-see for nerds and fans of competitive gaming. This documentary following the adventure of Steve Wiebe trying to overthrow the all-time high score record for the arcade version of Donkey Kong. You can’t help but root for Wiebe, and the great shots the crew that follow him gets beautifully narrate the journey. It’s on Amazon for little over $17, but you may be able to find it on G4 time to time. Tim Burton struck a cord with the world of musicals (both live action and stop motion), and has been known for being one of the best creative sponsors for Hot Topic clothing lines while simultaneously butchering children classics like Willy Wonka and the Chocolate Factory. The talented eye of director, or as I like to call it, hack, Tim Burton seemed to be a perfect fit for Lewis Carroll’s masterpiece “Alice in Wonderland”, and for the most part of the film, that idea holds true. 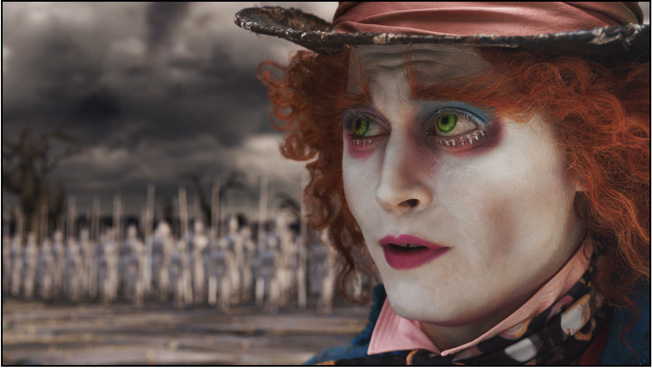 While at times Burton’s own creative vision can be overbearing,once some of the lead performances like Depp and Hathaway have their time to blossom and the atmosphere and story finally hit their stride, Alice in Wonderland truly finds the niche it was looking for all along. Burton’s take falls into the rabbit hole almost 15 years after the “Alice in Wonderland” story we’re familiar with, taking on a brave new “Underland”, in which the White Queen has been overthrown by the evil Queen of Hearts with the help of her majestic dragon, the Jabberwocky. The reluctant, older Alice is handed the task of defeating the Jabberwocky, who is referred to constantly throughout the first half, leading up to the Peter-Jackson-esque climactic battle at the end. Tim’s interesting revolution on the story really pays off as everyone and their grandmother knows the original story of Alice in Wonderland. The world painted in this Alice in Wonderland is one that reminded me more of Avatar than anything else, but when it finally gets out from Burton’s wing it really achieves the creative potential initially envisioned that it’s really capable of. Some of Carroll’s greatest elements of story were his characters, and Burton has made a few great calls for his re-telling. Johnny Depp was born to portray a character like The Mad Hatter, bringing to life the demeanor, style, speech and humor perfect for every moment he’s on screen. I vividly remember leaning to a friend and whispering “Thank goodness he’s finally here” during the introduction of the character in the really well-done tea party sequence. He, along with Anne Hathway, pull out some of the best performances and hit the creative nail right on the head. Even Helena Bonham Carter hits the mark a few times but can sometimes be a little too over the top. It’s a shame though that the rest of the cast, whether because of the script doesn’t favor them or they just can’t play the part that well (much like Johnny Depp trying to play Willy Wonka), they just aren’t as interesting or fun to watch as they should be through the movie. The lead of the film that portrays Alice is the perfect example of that, who’s just really one-note and boring through the whole film. Let’s take a regular girl, slap on a weak female-empowerment subplot, an awkward British accent, and you have the lead of Alice in Wonderland. We should have just saved time and called it “Mad Hatter in Wonderland”. It’s also worth mentioning to bring up the case of CGI vs. Practical. I’ve always been a huge fan of practical effects. (If you take the computer-animated shot of Magneto flipping multiple cars in X3, and you compare that to the truck flipping-scene from The Dark Knight that is completely practical and real, it’s obvious the practical shot is always the better one.) Most of the CGI in Wonderland, particularly like TweedleDee and TweedleDum, works really well. There’s something about how he uses the generality of CGI Effects to his every advantage to create a beautiful world previously thought impossible. However, there were a lot of CGI shots (particularly backgrounds, some animal characters, and character enhancements) that just didn’t have any weight to them. My disdain for some of Burton’s weirder styles didn’t particularly help in most cases. All in all, there wasn’t a better fit for the job than Tim Burton and how he inventively integrated the two with his own choice of unique performances and environment styles. As I said earlier in the review, it wasn’t until Depp’s arrival that the movie found its footing, after that, the movie becomes the great fantasy-action title it needs to be. So good news/bad news, you get to see 2/3 of a really awesome movie, but the bad news is you have to see 1/3 of a pretty bland film. While it may/may not be worth noting I personally thought the script in the movie was a little snooty. Half of the movie I couldn’t really follow the movie’s story because it was too focused on trying to be too smart for it’s own good. Of course, not all of Tim Burton’s oh-so clever “charm” worked for me, I found myself rolling my eyes more than once at some of the “genius” character models and dialogue. Not to mention a few terrible decisions for some of his Burton-esque shots he decided to leave in the film, specifically the break dancing sequence that takes out all seriousness already established from what’s supposed to be a heartfelt moment. This makes me sound like I hated the movie, but I really did enjoy the movie. It’s just what faults it has are noticeable, but what it does right it nails it on the head, it was really awesome and I definitely recommend it. This ended up being the kind of movie I would have loved as a kid and watched countless times. It’s an adventurous fantasy fable that would have stayed in my VCR for weeks. It’s all about how it’s a love/hate movie, there’ll be those that love this and but the shirts and what not, and others that’ll be put off entirely. The 3-D is also used in a great way in a lot of scenes (the first rabbit hole scene in particular) that works really well for the movie and gives me some good hope for the future of the tech. Alice in Wonderland is a film drenched in creativity for both its leads and its atmosphere, which can be a two-sided coin. I highly recommend it for eccentric film buffs and the younger crowds alike, although some of the weirder choices in the film may keep a few from re-entering the rabbit hole. It’s the beginning of March (I thought it was pretty funny it snowed today, when there’s a Simpsons episode where they had a misprint of a 13 month calendar with the month “SMarch”, when at the beginning of that month Homer says “Lousy smarch weather…” as he’s coming in from a snow blizzard), and I have began to think about all the coming movie releases of the next 9 months (my movie pregnancy haha), along with the 4 films I’ve seen so far this year. I thought I’d give a recap of those 4 movies so far and a brief thought of how good/bad they were, and then move onto which movies I’m looking forward to the most in the next year and which I plan to definitely see. First I saw the film Daybreakers (review posted on site and Facebook), which was a really campy vampire horror film. Willem Dafoe and Ethan Hawke are really great in their parts in the film, but a few parts can be a little too cheesy for their own good. Definitely worth a rent. I then saw Legion, which was a ginormous piece of crap worth noone’s time. After I came down with a very serious case of food poisioning E Coli, I saw Joe Johnston’s The Wolfman, which I did enjoy quite a bit more than I thought I would. It’s a fun B-Movie worth the trip to the theater, some really fun performances and a very fun gore-fest that had me entertained throughout the entire 2 hour time span. Sure the movie’s a little uneven and cheesy but it’s worth your time. Finally of course I saw Shutter Island and that’s one of the best films I’ve ever seen, 100% worth your time (check review below on site for more). Alice in Wonderland-March 5th-If anything else I want to see this film out of curiousity, because I’m not 100% sure I like this movie or not. I don’t like Tim Burton, however I’m interested in Depp and Hathaway’s performances. I’ll make the trip out to the theater for sure for this one in the next week or so. 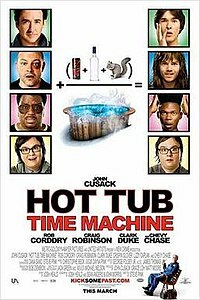 Hot Tub Time Machine-March 26th-It sounds ridiculous, it looks ridiculous, but I have a feeling I will really enjoy this movie, and will definitely make the trip to see this one on the Beta Convention this year, if anything else to be able to say “I remember on my senior beta convention I got to see “Hot Tub Time Machine” haha. Clash of the Titans-March 26th-My Dad and I have already promised eachother we’ll see this. Plus, Liam Neeson plays god. The Losers-April 23rd-I’m a big fan of Jeffrey Dean Morgan, and anything with him involving a graphic novel adaptation that’s not Watchmen catches my attention. Nightmare on Elm Street (2010)-April 30th-I recently checked out the newest trailer for this, and I really can’t wait for this. Jackie Earle Haley is showing up as Krueger, and it looks to be a fun ride with some fun violence and great performances. Get Him to the Greek-June 4th-This is a spinoff of Russell Brand’s character from Forgetting Sarah Marshall, combine that with the very funny Jonah Hill, let the same director from F.S.M. direct and let Apatow produce, I’ll see it. Toy Story 3-June 30th-Although I’ve started to doubt whether or not this third film’s going to be any good, I have some confidence Pixar can do something really fun and heartfelt with this, I’m not going to expect any less. Inception-July 16th, 2010-Christopher Nolan’s newest film since The Dark Knight, Leonardo Dicaprio is a detective that goes inside the mind, and it’s definitely my next most-anticipated film for the rest of the year. It looks really great and I hope it can live up to that. Cillian Murphy (Scarecrow), Ellen Page, Marie Coutillard, and Tom Hardy also appear. Dinner for Schmucks-July 23rd-Paul Rudd, Steve Carell, and Zach Galifianakis are some of my favorite comedy talents and they’re all teaming up for a promising screwball comedy. Legend of the Guardians-September 24th-Really, the only reason I’m interested is Zach Synder’s involvement as director, I have no interest that it’s about the “Guardians of Ga’Hoole” book series. The Social Network-October 1st-This is a movie based on the founding of Facebook, and it seems it’ll be a really interesting film on that, or it can be really pointless. The Zookeeper-October 8th-It’s Kevin James talking to animals voiced by Adam Sandler, Sylvester Stallone and Rob Schneider, what’s not to like?!? Besides, Paul Blart worked out so well… Right?!?! Red-October 22nd-Bruce Willis assembles his team of specialists (Morgan Freeman, Helen Mirren, John Malcovich) to save his life after being attacked in his home. Sounds awesome, plus Morgan Freeman, I have no choice. Due Date-November 5th-Todd Phillips’ newest film since The Hangover, Robert Downey Jr. and Zach Galifianakis are teaming up on a road trip comedy so Iron Man can make it to his child’s birth. MegaMind-November 12th-This seems to be one of the best-looking comedies of the year with Will Ferrell and Jonah Hill doing voices in it in a really interesting plot twist or two. The Chronicles of Narnia 3-December 10th-I really hope this works after it’s switched hands so many times. The Green Hornet-December 22nd-My second most anticipated of the year, it has Seth Rogen, Michel Gondry (director of my favorite film of all time), and Christopher Waltz (one of the best villains of last year and in any Tarantino film), all in a superhero flick I can’t wait to see. True Grit-December 31st-The Coens are doing another Western film since “No Country for Old Men”, count me in. Okay I’ll admit I mainly posted this because I forgot about it until James posted it on his site. Anywho, this is a general list, followed by a Top Ten List of my favorite (and most enjoyed), not to mention worst films of the year we used to call 2009. Worst Film of 2009-Old Dogs, mainly because it had so much promise, it could have been so much funnier, and it just fails on every single one of the fronts.